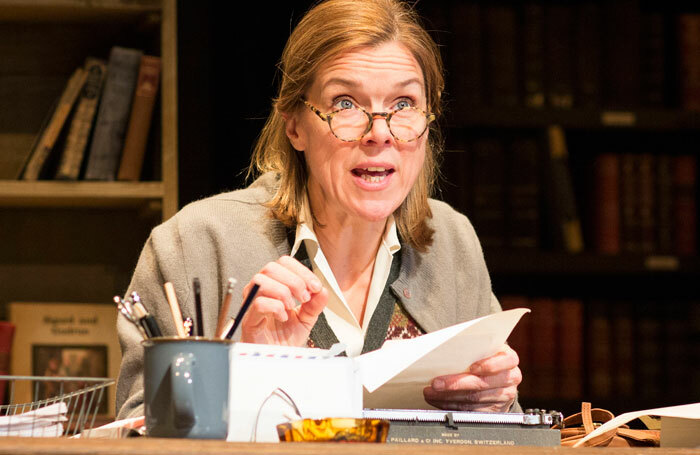 This stage version of Helene Hanff’s 1970 memoir of her love affair with rare books and the London bookshop that regularly shipped them to her in New York has come home – not to its Charing Cross Road setting, but to Salisbury Playhouse who premiered it in 1981, before it transferred to the West End, Broadway and the cinema screen. It is directed by 87-year-old James Roose-Evans, its original director and adaptor. The play’s action begins in 1949, 50 years before online booksellers began to dominate the market, and there’s something transfixing here about the sheer romance of real books. But this quietly joyful, meditative drama offers something else, too – a loving portrait of a special relationship. This is conducted entirely by letter, between abrasive single New York screenwriter Hanff and a married London bookseller named Frank Doel and it touches them both profoundly. But just as books themselves are far more permanent and everlasting than electronic ones she orders books that are more than a century old here, there’s also something deeper about the affecting and affectionate relationship that passes between these two strangers as one meets the other’s literary needs – and the other reaches out with gifts that, in austere post-war Britain, bring a different kind of delight to their recipients. These include the five other staff of Marks & Co booksellers at the eponymous address. Roose-Evans craftily includes them in a bustling portrait of a sleepy-seeming shop only the absence of any other customers lets it down; were all their clients mail-order only?. Also returning from the original creative team is lighting designer Peter Hunter, which casts a warm glow over the production in every sense. Though both Janie Dee as Hanff and Clive Francis as Doel suffered a few line stumbles on press night, they otherwise expertly catch the low-key rhythms of this play to provide a moving picture of a relationship that’s tender and surprising. So is the play: old-fashioned for sure, but none the worse for it.